Where is the school? Hai Quan School is located in a small countryside town in Xinjiang County part of Yuncheng Municipality District, Shanxi Province. Xinjiang is located south, south west of Taiyuan, the Provincial capital of Shanxi, which can be reached in about 2 hours by high speed train. To the south west of Xinjiang is Xi’an, a popular tourist city, the home of the famous Terracotta Warriors, which is also 2 hours away by high speed train. Yuncheng city is closer, accessible by local bus 2 hours, or high speed train (20 minutes), but to the Yuncheng city centre about an hour. Lots to see and do in this vicinity! Visit the Yellow River, go hiking in the mountains, cycling clubs, enjoy the ambiance of rural village life in the countryside, or enjoy the faster pace and the shopping and western restaurants in Xi’an and Taiyuan on a weekend. All basic things can be bought in Xinjiang, or shop on the Internet for Western foods or other requirements. When would you be required to start? The English teaching positions are required to start in mid August 2018 for the new Chinese school year. The school year will finish in June 2019 depending which grade you teach. An ongoing renewable annual contract will be offered if the teacher demonstrates professionalism and competency. Free modern well equipped apartment is supplied: Incl. water, gas, electricity up to RMB200 per month. Underfloor heating, air conditioner, 2 bedrooms, sitting room, kitchen, computer, internet (+-50rmb a month at teachers expense, but you have to pay for a full year in China), TV, if required. How many classes per week will I be required to teach? 20-22 classes per week. (45 to 50 minutes per class), all morning and early afternoon classes are 45 minutes long. The last class in the afternoon from 16.20 to 17.10 is 50 minutes long. If you get more than 22 classes then you will get extra pay. Maximum classes would be 25 upon agreement by the teacher, if extra classes are required. Normal maximum is 22 classes per week, Monday to Friday. No weekend and no evening classes, unless the teacher wants to do this. The normal contract is only day time classes and no weekends. -There are currently 3 native English speakers teaching at Hai Quan school, all male and over 50 years of age, but young at heart. Younger native English teachers, of either gender, are most welcome to apply. Couples also extremely welcome. -Salary: Starting rate 8000rmb/month. Plus a 8000rmb bonus at the end of the one year contract. Pay date is the 25th of the following month. When you leave everything is paid a week before you leave. -Full return airfare will be paid at completion of the contract/ end of the school year, or a One Way airfare if you are not returning. The return airfare is paid when you return, to avoid people absconding. -FULLY PAID winter holidays, and fully paid summer holiday, if you sign another year’s contract in March/April each year, (these are paid when you return from the holidays, so that you cannot just abscond). Approximately three and a half months holiday per year. 5 to 6 weeks in Winter and the balance for Summer holidays. N.B N.B. If Teachers start half way through the school year, the holiday pay would be pro-rata for the Summer holidays. N.B. Not full pay as you will not have completed a full years contract/service. -Three, free meals daily at the school canteen if you desire, or you can cook at home. -No teachers assistant is provided while you are teaching. You will be on your own-you so you can basically teach whatever you like, however, teachers are expected to be well prepared and professional. Lesson Plans are expected to be done to show what you are teaching, and to ensure you are not just goofing off. The school have a Printing Department to print all your lesson requirements. -you can easily save money for traveling or whatever, as it’s cheap to live here. Depending on your personal life style it’s possible to live here on as little as 1000rmb/month or less. -Native English speakers from either the UK, Ireland, South Africa, the USA, Canada, Australia or New Zealand. -University or College degree/diploma (needed for Z / working visa). TEFL, TESOL or ESL Certificate required. -Release Letter with recommendation from your school if already employed in China. -school also provides health insurance and accident insurance. -school does ALL the paperwork for your visa but it takes time, 2 – 3 months. They also pay for your visa and medical examination required to get your visa approved. 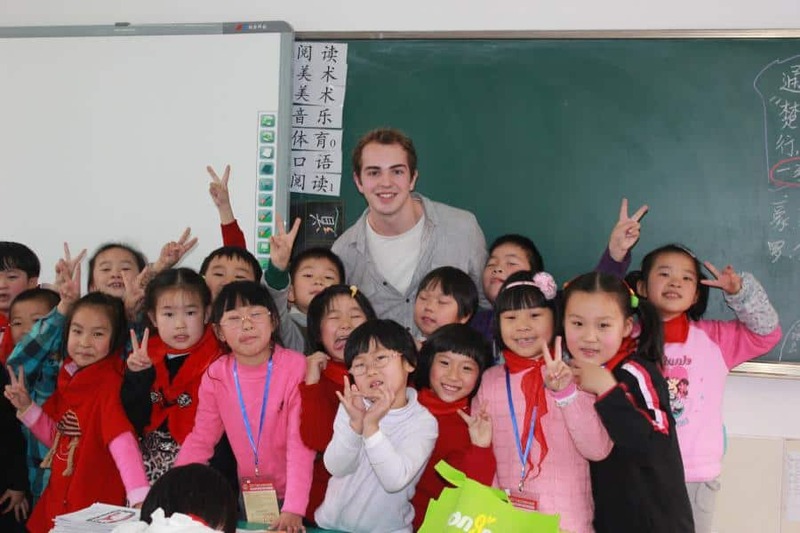 Why is Hai Quan School looking for native English teachers? The school’s student intake grows every year. We have been employed at the school for five years. The school has many top students, and is well known and respected. If you have any questions feel free to contact either of us, or send us all your details that are required. These include Application letter, Copy of Passport, C.V. With full background, qualifications included, photo, etc. Any references relating to your background, teaching style, school references, or suchlike. If you do not hear from us within two weeks please regard your application as unsuccessful. Mark Dinning. (British/South African) Guy Edwards. (Australian).